As I said a few weeks ago, we have now entered Year 5 of Perspectives from the Leading Edge (PFTLE [link], in the now deceased Semiconductor International) plus Insights from the Leading Edge (IFTLE) that you find here every week in Solid State Technology. Both of these are due to the trust that Pete Singer, editor-in-chief, showed in me five years ago. When I started many said it would be impossible to get enough fresh material for a weekly technical blog in 3DIC and advanced packaging. I think we have proved the naysayers wrong! I have tried to fill these blogs with the data, because we are scientists and we want to see the data. I have not made an exact count, but I would bet that there have been more than 1000 figures that have come to you in the more than 200 blogs as we enter Year 5. I said IFTLE 78 would be something special — and I am a man of my word. First, I will review two of the most entertaining stories of the year, stories that hopefully made you laugh and will yet again. 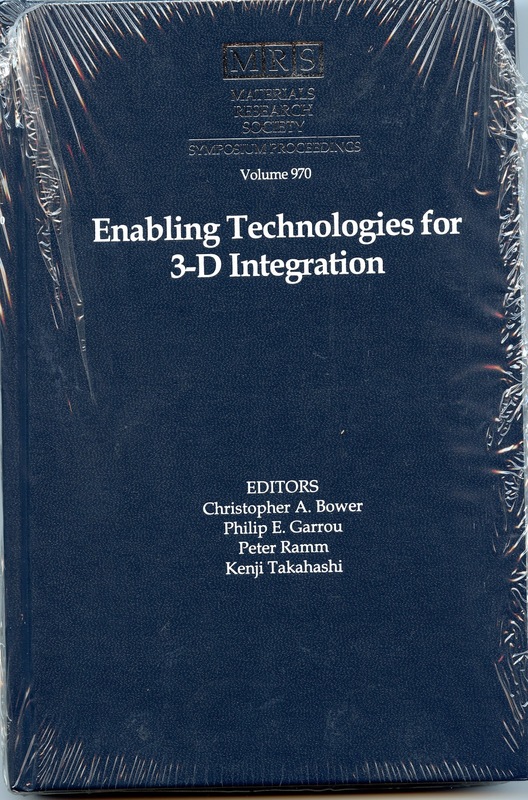 Then we will have a contest: the winner of the contest will win a copy of MRS volume 970: "Enabling Technologies for 3D Integration" edited by Bower, Garrou, Ramm and Takahashi, still in shrink wrap (photo at left). The winner will be determined by whomever can identify the largest number of people (name and current affiliation) that you have seen previously on the pages of PFTLE/IFTLE. This is a take-home quiz so you can go back to the old blogs and check — but do it quickly! The winner will be determined as whomever sends in their email response the soonest, based on arrival date and time, at the following email address: pgarrou/contractor@rti.org. The contest officially ends on Dec. 31st, 2011. Only responses to that email will count — responses sent to my other email accounts will be disqualified. Employees of Pennwell, Microelectronics Consultants of NC, TechSearch International, Yole Développment, or Research Triangle Institute are disqualified (but can send in their guesses if they want to). The winner will be announced in early January 2012 along with a picture and short bio. Good luck to everyone! 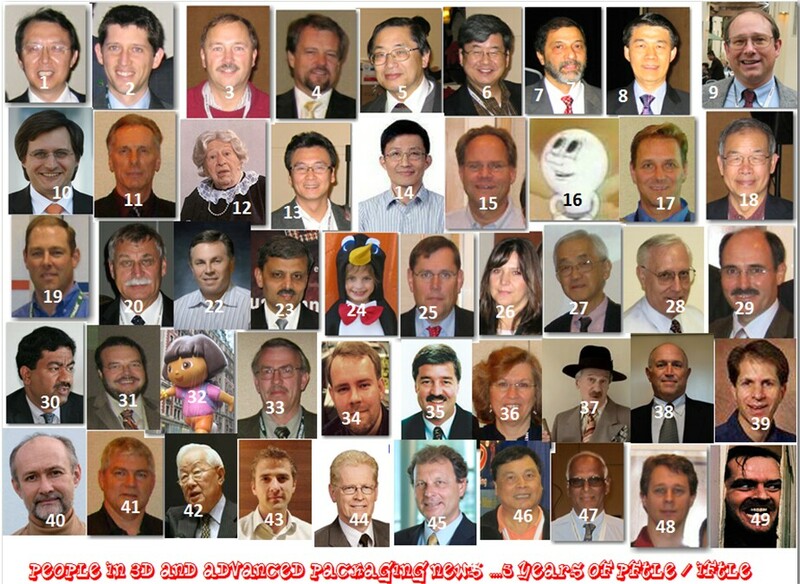 The second most entertaining story can be found in IFTLE 47, "IBM 3D Cooling, TSMC Pkging, UMC 3D Equipment, the CIS Mkt Grows." 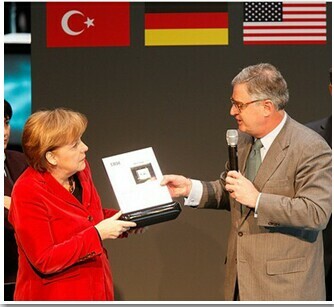 This past spring at the Hanover Fair Germany, IBM CEO Sam Palmisano presented German Chancellor Merkel with a prototype of the IBM liquid cooling 3D chip stacking project developed at IBM Research-Zurich (see below). In front of the assembled audience and press, Merkel asked Palmisano: "Did you take this from Intel?" Quick on his feet, CEO Palmisano replied, "No, ours are better." The Number One most entertaining story was reported in IFTLE 62 "Whats in a Name?" An EE Times article reporting on information released by the Taiwan External Trade Council quoted an "anonymous source" saying that "TSMC’s projected delivery of 3-D chips matches that of Intel, the world’s biggest chip maker". Only problem is that TSMC was talking about stacked 3D chips and Intel was talking about trigate transistors (i.e., finFETs). Nothing in the story made much sense since they were trying to compare apples to oranges — as many of the subsequent commenters pointed out. - "TSMC is referring to 3D interconnect structures using through silicon vias. This has been in existence for quite some time, at least in R&D. What intel has built is a 3d transistor. There is a lot of difference between the two. Kindly refrain from misleading people. This is wrong information. Please correct…"
- "FINFET and TSV 3D are two completely different technologies. The report is confusion and misleading by comparing these 2 technologies…"
- "I agree that this article is terribly misleading and really doesn’t make a lot of sense as it mixes apples with oranges. I don’t think the author is technically very well informed on this subject…"
- " It’s a BS article – trying to make a connection to Intel Tri Gate is nonesense and misleading…"
- "Dumb article. As others have said, Tri-Gate transistor technology is a totally different thing than TSV interconnect technology…"
- "Beating Intel to 3D" by comparing TriGate to TSV is nonsensical…"
- "Is eetimes becoming a tabloid? I am wondering about the credentials of the article writer!" - "I agree, what a pathetic article. I’m not an EE or even close to one, but even I know exactly how wrong and stupid this article is…"
WOW. We should note that EE Times offered an apology and correction shortly thereafter. So, time for the contest… Below you will find the faces of 49 people whose stories have filled the pages of PFTLE/IFTLE over the years. Send in your guesses as to who they are and where they are employed — and you could win the prize! Good luck everyone, and thanks for your continued readership! For all the latest in 3DIC and advanced packaging stay linked to IFTLE……….